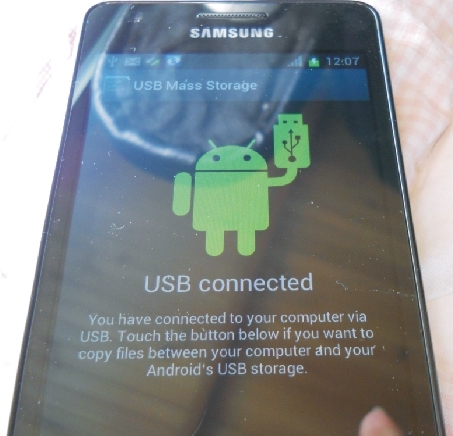 How to upload photos for Samsung Galaxy SII, Gingerbread build… I hope. I’ve been trying to find info for people using the Gingerbread build of Samsung Galaxy SII. Gingerbread is an older build and I’m not sure if the info below applies to it or not, but the post was written a year and a half ago so the timing seems right. I have copy/pasted the info below directly from the post I found. To check out the entire thread, click on the following link. saves me re-typing..one thing to note, I think it’s DCIM\100 not just DCIM). the DCIM folder contains your photo’s taken from your phone.. This is after you Set your Photo to Mass Storage. Step 3. Use the Top Status Bar and pull it down. Your Device SD is now mounted to PC and is acting as a Mass Storage Removable Disk. There you’ll find your DCIM folder Plus other folders. Step 1a. Close the Removable Disk Folder and Make sure No Files is Transferring and/or make sure no program (including windows) is talking to the Removable drive. Step 1b. You can Safely remove your Drive from your computer. But this step isn’t necessary. Step 4. a Pop up will show up. Click “Turn Off” – This will Dismount your removable Drive from your computer. Step 5. Unplug your USB cable. You have another Option. Download Samsung Kies. from Samsung Official Website. Support for that program is offered by 1-800-SAMSUNG. Although I personally ill advise using that program unless you need to update your phone or back up Device Memory Contacts. That program has known issues and Samsung has taken it off there website numerous times to do “Patch updates” on it to prevent it from crashing. Finally, if having issues…start over (unplug from computer)..
As you can see, the alternate method is pretty much the one I described in my original post. Hopefully, most people will be able to upload their pics using one method or the other. Finally, if all else fails, beg, borrow or buy a new USB cable in case the one you have is faulty. As always, I’d love to know how you go. Before I begin, I’d like to extend a huge thank you to the girl at Virgin Mobile who took my call, and walked me through the process with understanding and patience. 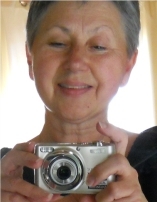 It took a while so… thank you! 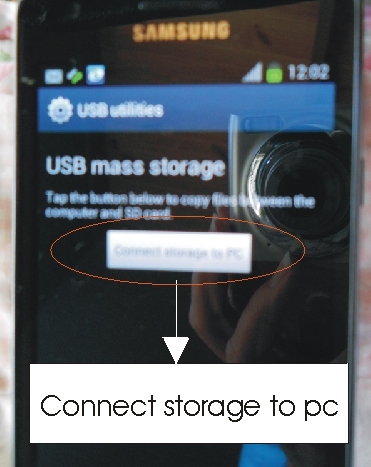 Now, the very first thing you have to do is make sure the Galaxy S II’s USB cord is NOT connected to your pc. If it is, none of the following steps, or screenshots will make any sense. More importantly, the process will not work because there is a strict sequence of events that must happen before you plug in the USB cable. I’m serious. UNPLUG IT! Step 1. Turn on your Galaxy SII and swipe the screen to unlock it. [I did warn you this would be basic]. Step 4. You should now be looking at the Settings menu. Right at the top there should be a category called ‘Wireless and Network’. I have circled it in yellow. For some reason known only to Samsung, the name of the category is in very small type and easy to miss. 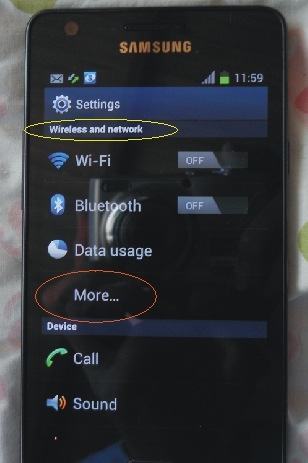 Under ‘Wireless and Network’ you will see options starting with ‘Wi-Fi’, and ending with ‘More’. I have circled this in red. Tap ‘More’. Step 5. Under the ‘More’ menu you will see a new set of options, including ‘USB utilities’. Tap ‘USB utilities’. Step 6. 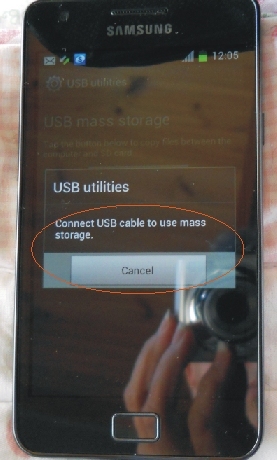 Under ‘USB utilities’ you will see just one option – ‘USB mass storage’. Beneath that you will see an icon telling you to ‘Connect Storage to pc’. Tap the ‘Connect Storage to pc’ icon as shown below. Step 7. Finally, you will see ‘USB utilities – Connect USB cable to use mass storage’. At last you can CONNECT THE CABLE!!!! Once you connect the USB cable from the phone to the pc, you will hear your pc make a noise to alert you to the fact you have connected a new device. On the phone, you will see a new screen. Step 8. 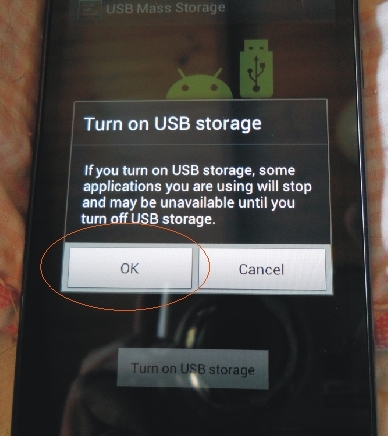 Tap the ‘Turn on USB storage’ icon and then tap the ‘OK’ icon as shown below. Step 9. From this point onwards, you will have to follow the Windows Wizard to transfer the photos to the folder of your choice. These should be fairly easy to follow, however if anyone needs help I can send you the screenshots by email. Step 10. When you have finished transferring your photos, you will see the following screen on your phone. 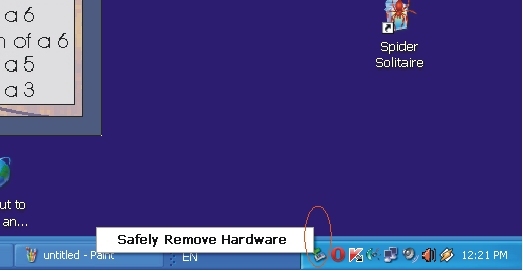 To unmount [or eject] your phone from the pc, look on the taskbar of your pc for the ‘Safely Remove Hardware’ icon [as shown in the following screenshot]. Step 11. Right click the icon and follow the Windows prompts. When you see the following Windows message you are ready to go back to the phone for the last step. Step 12. 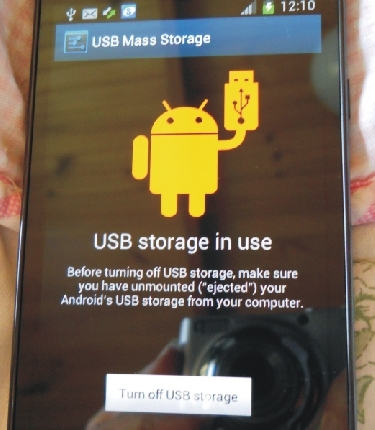 On your phone you can now tap the ‘Turn OFF USB storage’ icon as shown in the first graphic under Step 10. And finally, disconnect the USB cable. Phew. We’re done. The whole process is a bit convoluted but once you get used to it it’s bearable. Just.